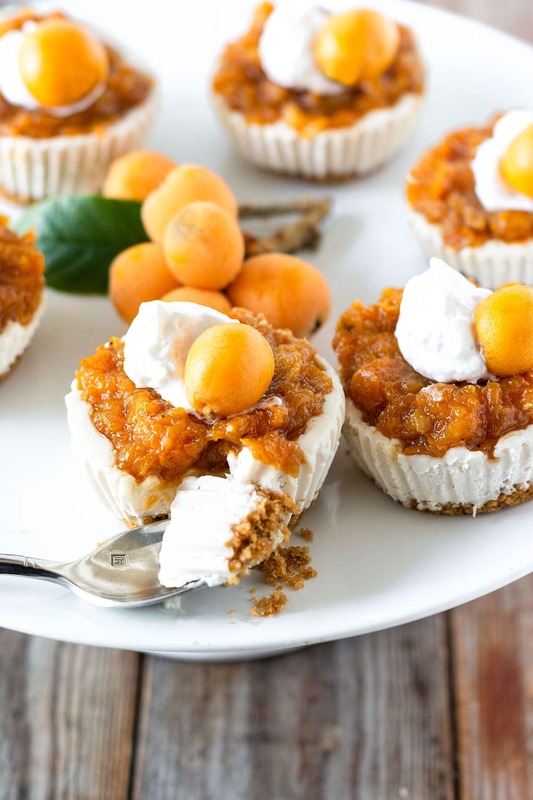 Rich and creamy loquat vegan cheesecake topped with fruity loquat jam in a homemade buttery graham cracker crust. 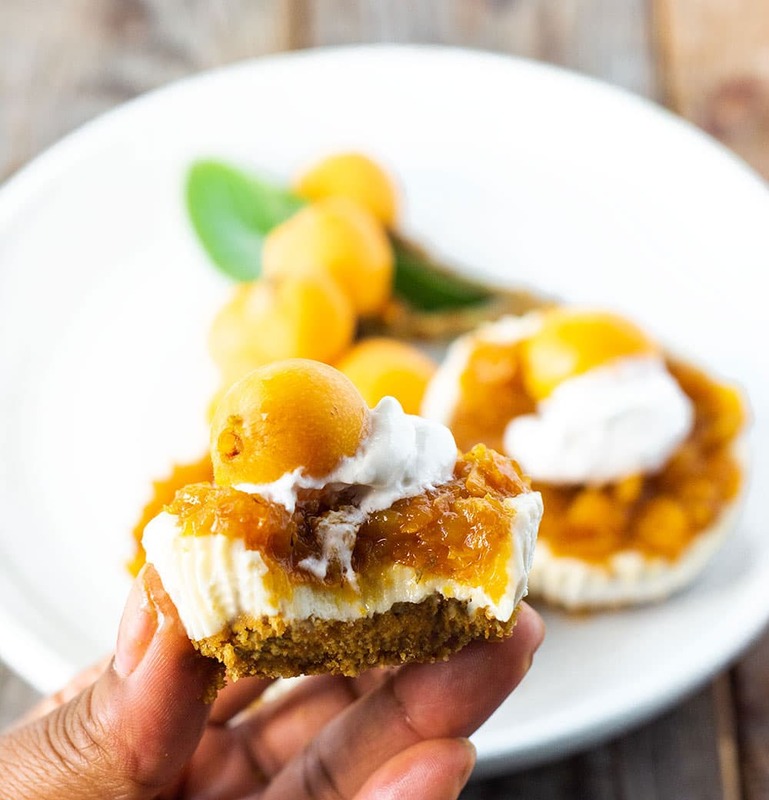 These individual mini cheesecakes are quick and easy to prepare and they are gluten-free and dairy-free. 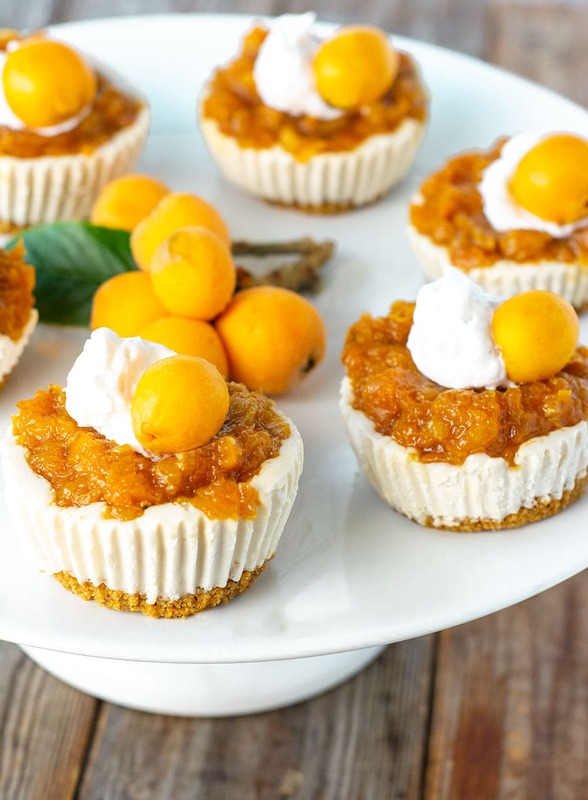 This loquat vegan cheesecake is the perfect dessert to celebrate spring, topped with juicy tree-ripened homemade loquat jam recipe is such a gourmet treat. If you haven't tried loquats then you are in for a treat with these small orange-fleshed fruits that taste like mango and peach. Learn more about the Loquat Fruit. Why Is Cheesecake Called Cheese? Before I ate vegan, I loved to eat cheesecakes, the smooth and creamy filling topped with a sweet fruity topping was comfort food at its finest. Although most people believe that cheesecake originated in New York, it actually came from Greece over 4,000 years ago. At that time it was made from pounded cheese, honey, and wheat flour that was heated in a pan then cooled. Later when the Romans invaded Greece, they modified the recipe to include eggs and crushed cheese which they called 'Libum'. As the Roman empire grew, they introduced cheesecake throughout Europe, where eggs, butter, and sugar were added with cheese. When the Europeans migrated to the United States, they brought cheesecake, where cream cheese was first added instead of cheese. In the United States, there are now many variations of cheesecake from New York Style to Chicago Style where sour cream is added, Philadelphia, and even in St. Louis has its own version..
What Is Loquat Vegan Cheesecake Made Of? How To Make Vegan Cheesecake? To make the loquat jam, cut each loquat in half, remove the seed and thick membrane, peel the skin for a softer jam or you can leave the skin on. Chop loquats and cook with sugar, lemon juice, and water until thickened. Remove from stove and allow to cool. Please note that loquats can stain your hands and clothes while preparing your loquats. You might want to wear a pair of gloves and or apron. 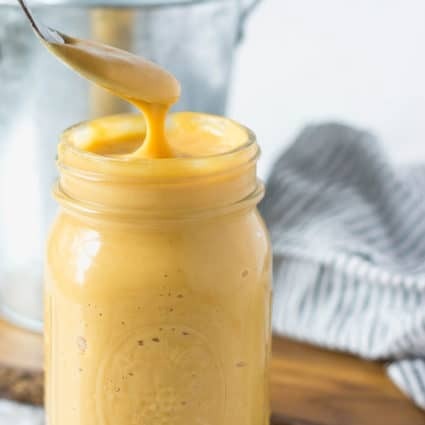 My loquats were exceptionally sweet so I didn't really need that much sweetener so you can adjust according to your taste, you can also substitute sugar with maple syrup. Loquat like Apple has lots of pectins so you shouldn't need added thickener to thicken your jam, just cook until you reach the desired thickness. 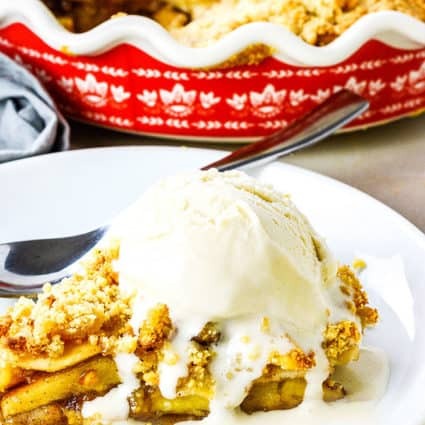 To make homemade graham cracker crust, combine graham cracker crumbs in a small bowl with melted butter. Press crumbs mixture in the bottom of 12 paper-lined muffin cups for mini cheesecakes or 8-inch pie plate .. Bake crust in a preheated oven at 350 for 5 minutes. Remove from oven and set aside to cool. To Prepare the filling, prepare the cashews by soaking overnight or use the quick soaking method: Boil a quart of water in a pot. Remove from heat, add cashews, and cover. Soak for 30 minutes and then drain. Add cashew milk and sugar to a small saucepan, and heat on low until it starts to bubble. Remove from heat. Add milk mixture, cashews, lemon juice, vanilla, and coconut oil. Blend once. Add cream cheese and blend again. If it is not smooth, keep blending. The mixture should be very creamy but still runny. Allow filling to cool. Place filling into the prepared crust, place cheesecake in the freezer for 2 hours or overnight to set. Remove from the freezer, thaw for 5-10 minutes, add the loquat topping. and serve. 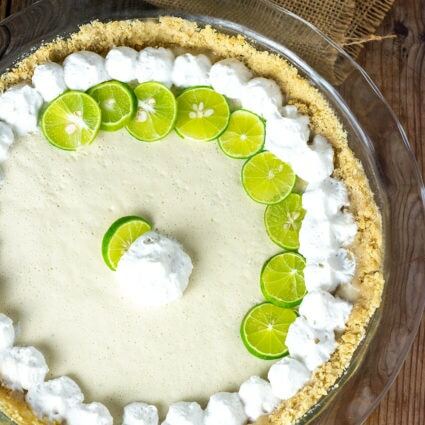 Can I Substitute The Topping? How Long Can Cheesecake Sit Out? Your vegan cheesecake should be kept refrigerated. Yes, you can freeze your cheesecake for up to 3 months. Leave the topping off and add at the time of serving. Other Amazing Vegan Dessert Recipes To Try! Preheat oven to 325 °F. Crumble graham crackers by pulsing in food processor until finely crushed, or alternatively, place in plastic storage bag and pound with a hard object, such as a rolling pin. Prepare your baking dish. This recipe can make a standard pie, about 15 muffin sized mini pies, or 12 mini pies. If you are using a muffin pan, use cupcake liners for ease of removal. Mix the graham cracker crumbs and butter in a bowl, then add to prepared pans. The mixture will be quite crumbly but will come together with you pressing on it. Place in preheated oven for 5 minutes. Remove and let cool. Add the prepared loquats with water, sugar, lemon juice and sauce to a saucepan. Bring to a boil, reduce heat to simmer for about 30 minutes or until thickened. Keep stirring jam periodically to make sure the bottom doesn't burn. Remove saucepan from the stove and allow to cool. Add cream cheese and blend again. If it is not smooth, keep blending. The mixture should be very creamy but still runny. Pour filling into prepared pans and place into the freezer for 2 hours, remove from freezer, sit cheesecake at room temperature for 5-10 minutes and top with loquat jam. Enjoy!